Gov. Linda Lingle discussed the earthquakes and their problems yesterday with North Kohala residents who gathered at the Kalahikiola Congregational Church community hall. The church was heavily damaged where major portions of the wall collapsed due to the earthquakes, leaving gaping holes. After speaking with the residents, Lingle toured the damaged church. Jennie Vega, above left, shared her concerns with Lingle as they stood amid the rubble of the church. KAPAAU, Hawaii » The estimate of Big Island earthquake damage is likely to top $100 million, Civil Defense officials said yesterday. The updated estimate came as Gov. 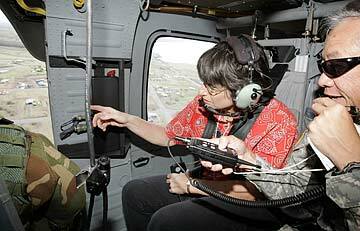 Linda Lingle met with Big Island residents, seeing the human faces behind the numbers. 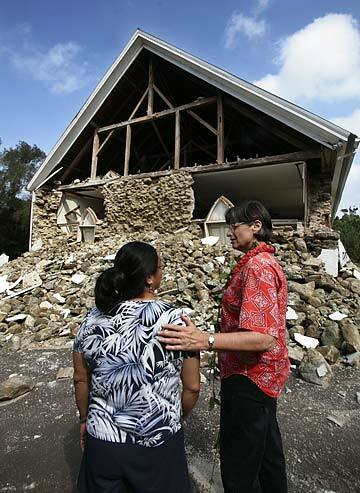 Meeting with residents at a church hall next to the severely damaged Kalahikiola Congregational Church in North Kohala, Lingle said, "My heart is here with you." Lingle told them state adjutant Gen. Robert Lee, who is also head of state Civil Defense, is providing National Guard troops to assist in the area. Hawaii County Civil Defense raised its damage estimate to $96.4 million yesterday, but that number does not include the damage done to private homes. The numbers keep changing, explained county Civil Defense chief Troy Kindred. With an unknown but rising dollar value for homes, plus continuing increases in other categories, there was little doubt that the eventual total would top $100 million, Kindred said. The state and county have differing estimates of the number of homes damaged. Lee reported Wednesday that 1,159 homes suffered damage, based on Federal Emergency Management Agency estimates. Hawaii County listed only 92 homes damaged yesterday. The county number came from the Red Cross, Kindred said. But with 5,000 home assessments done by the Red Cross to date and only 92 homes found with damage, there is a need to take a closer look at those numbers, he said. In North Kohala, resident Dixie Adams arranged for about 25 residents to meet with Lingle yesterday. About 75 people showed up. Standing near quake-damaged Kalahikiola Church, with gaping holes in its walls, Lingle met people who quietly asked for answers. "What shall we do? I tried to call FEMA every morning," said a woman who gave her name as Kimo. Residents also said about 80 percent of the homes in the area had shifted on their foundations and needed repairs. Lingle explained that FEMA had not yet approved the Big Island for individual assistance, despite President Bush's declaration of a state of emergency. She encouraged residents to file damage reports with state authorities so they could make a better case for federal aid to individuals. "I can tell you our chance of getting assistance depends on how serious it is and how much damage there is. That's why this documentation is so important." "I can tell you our chance of getting assistance depends on how serious it is and how much damage there is. That's why this documentation is so important," she said. Lee said National Guard troops will be called in to help residents fix homes, among other duties. About 24 are currently in West Hawaii working to help clean up the area, he said. Sharon Hayden said children are traumatized and need counseling. One 12-year-old boy lost his father three years ago, his grandmother last year, and has not eaten since the earthquake, she said. Ed Boteilho, whose dairy with 1,500 cattle provide about a third of the milk consumed on the island, said he is down to a four-day supply of water. "You can't milk cows without water," he said. The Kohala ditch, which supplies agricultural water for the district, collapsed in numerous places, he said. A tourist attraction, Flumin' the Ditch, which runs kayaks down the irrigation flumes, had to lay off 10 employees since the earthquake. "It has such effects. All the business and trade that come to our town, the ripple effects are significant," said Forrest Arnold, who runs a bamboo and coconut palm plantation. But with the desperation, there was also hope, the owner of Kohala Village Inn was sending construction crews around, providing building materials and helping people at his own expense, Hayden said. Lingle also dismissed criticism from her opponent in next month's election that her administration bungled the response to the earthquake, saying the work ahead was too important to be used for politics. Lingle spoke one day after Randy Iwase, the Democratic nominee for governor, blamed Lingle for responding too slowly to the disaster, saying it showed the state was unprepared to cope with the emergency. "I know there is a campaign going on, but this is too serious to be campaigning about right now," Lingle said.